Should Investors Fret Over AT&T Inc's Debt? Moody’s retains its negative outlook on AT&T’s credit rating. Last February, Moody's Investors Service downgraded AT&T's (NYSE:T) senior debt rating from A3 to Baa1. The ratings agency claimed that AT&T's $18.2 billion purchase of AWS-3 wireless spectrum licenses and its $49 billion acquisition of DirecTV would push its "leverage well beyond the 2.5x (Moody's adjusted) upper limit of AT&T's prior A3 rating". Moody's also declared that AT&T's "weak organic free cash flow" could "heighten credit risk" and that "the current level of dividends will prove to be unsustainable." Last month, Moody's gave AT&T's new senior notes a Baa1 rating, but it maintained a negative ratings outlook, warning that the new offering would keep AT&T "near or slightly above the 3.0x limit" for a Baa1 rating. Moody's noted that while the DirecTV acquisition would "relieve some EBITDA pressure," "ongoing weakness in wireless revenues or a large asset purchase could place additional pressure on AT&T's ratings." Once again, it warned that AT&T had a "weak retained cash flow due to its high dividend". Should investors be concerned about Moody's bearish comments? Let's take a closer look at AT&T's debt situation to find out. How much debt does AT&T have? AT&T's long-term debt rose 56% annually to $118.5 billion last quarter. Its current liabilities, including $7.6 billion in debt which matures within one year, rose 28% to $37.3 billion. AT&T finished the quarter with a net debt to adjusted EBITDA ratio of 2.31, up from a ratio of 1.75 a year earlier. By comparison, Verizon's (NYSE:VZ) long-term debt declined 6% annually to $103.7 billion last quarter. However, its current liabilities still rose 25% to $35 billion, including $6.5 billion in debt which matures within a year. Verizon's debt-to-earnings situation is comparable to AT&T's -- it finished the quarter with a net debt to adjusted EBITDA ratio of 2.3, down slightly from 2.4 in the prior-year quarter. 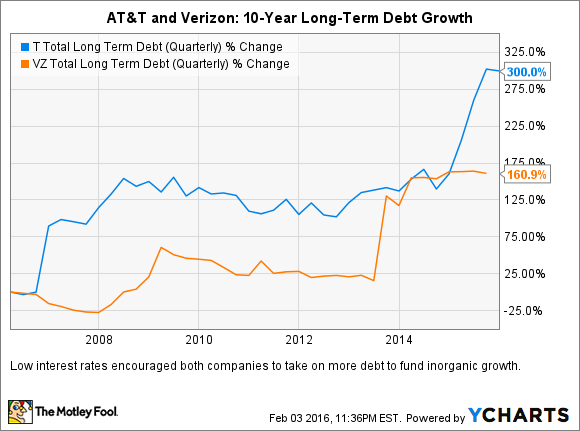 AT&T and Verizon both issued so much debt over the past five years because interest rates were unprecedentedly low. However, both companies still have to maintain healthy cash flows to reduce that debt at a reasonable rate. During last quarter's conference call, as transcribed by Thomson Reuters, AT&T CEO Randall Stephenson admitted that the company "spiked" debt levels with the spectrum and DirecTV deals, but that it will "spend the next couple of years working the debt back down" before "talking about different capital allocations in terms of share buyback or anything of any magnitude." Stephenson also emphasized that AT&T's strong cash flows would enable it to pay dividends and reduce debt within the coming year. In fiscal 2015, AT&T's free cash flow rose 60% annually to $15.9 billion, thanks to its acquisition of DirecTV. AT&T also expects its FCF, earnings growth, and dividend payout ratios to stabilize as the DirecTV acquisition becomes earnings accretive within the first year. Moody's report overlooks three important things about AT&T. First, AT&T could sell its Latin American pay TV business if things get really rough. The unit, which was inherited from DirecTV, serves 19 million customers but has been hit hard by unfavorable exchange rates. During an industry conference last December, Stephenson stated that AT&T would consider selling those assets, but that it was "in no rush" to do so. In mid-January, Reuters reported that Spanish telecom giant Telefonica was interested in buying the business for $10 billion -- which would definitely help pay off some debt. Second, Moody's glosses over AT&T's wireless growth in Mexico while mentioning its "ongoing weakness in wireless revenues." Last quarter, AT&T's 4G subscriber base in Mexico reached 44 million, exceeding its prior guidance of 40 million. The company expects that figure to hit 75 million by the end of 2016, which will expand its North American LTE coverage to 355 million customers -- more than any other carrier on the continent. AT&T's expansion into new markets, like connected cars and smart homes, could also diversify its wireless business away from regular mobile devices. Lastly, Moody's argument that AT&T's dividend could be "unsustainable" is a weak one to use against a dividend aristocrat that has hiked its dividend annually for over three decades. Last year, AT&T paid out 64% of its free cash flow as dividends -- a sustainable ratio with plenty of room for future hikes. In my opinion, Moody's negative outlook for AT&T is based on weaknesses which the company has addressed over the past year. The DirecTV acquisition will strengthen AT&T's free cash flow, while its expansion into Mexico will offset slower stateside growth in wireless revenues. If things get really bad, AT&T will likely sell off assets instead of suspending its annual dividend hikes. Therefore, investors should focus on AT&T's fundamental strengths instead of fretting over its long-term debt.